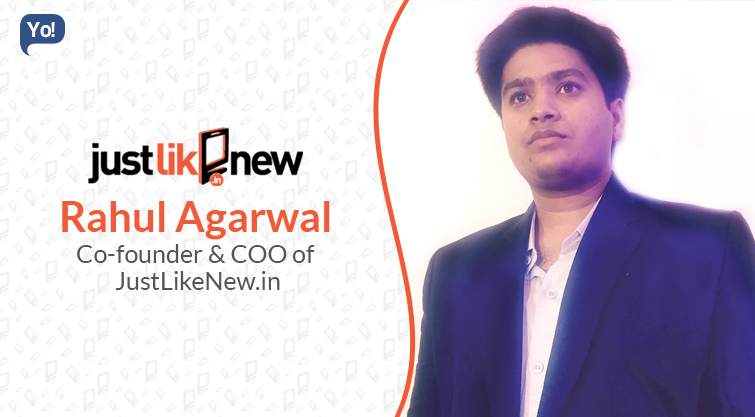 In June 2015, Rahul Agarwal, with his friend and ex-classmate AjitPanigrahi, founded JustLikeNew, a Hyderabad based online mobile repair service to address the gap between the fragmented mobile repair network & brands’ authorized service centers. Once the idea struck them, the duo engaged themselves in exploring the fragmented mobile repair industry of the country, even secretly learned mobile repairing. Having worked in corporates like Infosys, Aircel& Coca-Cola India, Rahul was able to quickly draw the necessary insights he needed to build the intended online portal. After getting good reception in the local market, JustLikeNew now has plans to expand to more cities and put more consumers out of the dilemma of choosing between the quality & high-priced service centers and cheap but unreliable mobile repairs of local shops. JustLikeNew.in is India’s premier smartphone repair service network which is leveraging technology to disrupt the smartphone & tablet after-sales services market. We are looking to bring in service standardization, enhanced transparency, and convenience, cost-effectiveness in the mobile repair industry in order to completely transform the end-user smartphone repair experience in India. The Indian smartphone & tablet services and repair industry, at present, is largely fragmented and unorganized. On one hand, we have authorized service centers which are very costly and time-consuming, while on the other, there are ‘mom and pop’ shops which are more or less a stop-gap solution that does not promise quality. Ultimately, the consumer has to make a compromise between cost-effectiveness and quality. Moreover, since there is no transparency in pricing of repair services for smartphones, the overall market situation is not very user-friendly. We noticed this gap in the smartphone and tablet after-sales services market and established JustLikeNew.in as a transparent, tech-enabled platform that leverages technology to deliver value-driven, high-quality repair & maintenance services. I firmly believe that no task is too overwhelming, and no challenge too big, if one only focuses on the task at hand. After all, every journey of a thousand mile starts with but a single step and every big success is made up of hundreds of thousands of small, everyday milestones. The most challenging part of my journey so far has probably been solving the problems inherent to the smartphone after-sales repair and maintenance segment in India. In a country as large and fragmented as India, addressing these gaps in service delivery has been a major challenge owing to the sheer scale and size of the task. Technology is the core around which we have built our end-user offerings, as it enables us to provide value-driven, high-quality repair & maintenance services for smartphones and tablets to the Indian consumer. Moreover, a better understanding of major consumer pain points and existing market gaps has allowed us to deliver highly tailored, consumer-oriented solutions and create a unique and highly satisfying smartphone repair experience. We have raised INR 1crore in seed funding and are in the process of raising a pre-series A. At JustLikeNew.in, we have a very horizontal hierarchy which encourages openness and transparency. Having an open work environment allows us to have two-way communication and leads to better employee engagement. Moreover, it also nurtures an innovative mindset within the organization which allows our employees to contribute ideas and makes them feel an integral part of JustLikeNew’s ongoing success. Hard work, clarity of vision and the zeal to succeed, according to me, are the three qualities every individual must have in order to achieve success. I like using news apps which keep me up-to-date with any developments in the national and international arena, especially business. I also like OTT messaging services such as WhatsApp and Messenger, which have streamlined personal and professional communications to a great extent. I also find mobile-based personal assistance apps extremely helpful, as they allow me to function without having to worry about trivial day-to-day tasks. I like to prioritize my daily workload before I begin my day. This activity allows me to streamline my work and helps me be more efficient. Moreover, since I have my entire day charted out in advance, it also helps me accommodate anything urgent that comes up during the course of a day within my schedule without much hassle. Although I like to maintain a healthy balance between my professional and personal life, there are times when I feel that I end up being too workaholic owing to our exciting long-term vision for the Indian after-sales services and maintenance industry. Over the next couple of years, the idea is to establish JustLikeNew.in as the industry leader when it comes to after-sales servicing of digital and electronic devices. We are looking to expand our physical presence to three more cities in the near future, and will be looking to diversify the services available on our platform by venturing into Buy Back, Insurance & Refurbished Sales in the near future. If I was able to start my career once again, I will probably look to gain more knowledge of multiple business functions such as sales, marketing, and HR and utilize the insights learned to add greater value to JustLikeNew’s business approach. My top three getaway destinations include Srinagar, Tibet and Sri Lanka. Thomas Alva Edison is reported to have said, “Our greatest weakness lies in giving up. The most certain way to succeed is always to try just one more time.” This quote remains a favorite and inspires me to try harder and work out a better solution every time I face a challenge in my personal or professional life.